Although I'm a ham operator with an Extra license, I really don't know a lot about electronics. It's always been an interest, but I've never seriously pursued it. Now that I'm going to teach a class of elementary students about electronics, I decided it was time I took a course myself. So I purchased the Make: Electronics book and the electronic parts to go along with it. My plan is to work through this in the next month to get a better understanding. AND it will be fun! 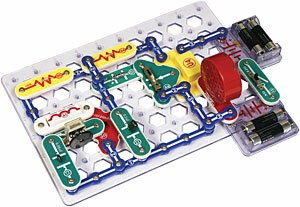 In addition, I am getting a set of Snap Circuits to practice with. I'm thinking of purchasing a few of these to get the students started in electronics. They seem to be easier to use for young children than a breadboard. After they get more experience, we will switch to a breadboard. At least that is my plan now. If anyone has any suggestions, let me know. My students will be 3rd-5th grade. We will have 15 lessons, 80 minutes each. Just finished The Welcome Committee of Butternut Creek - LOVED IT! The Welcome Committee of Butternut Creek by Jane Perrine is a wonderful book! I picked it up to read and just couldn't stop. Finished it in 24 hours. The story is about a young pastor who comes to a small town. The church where he is pastoring is run by the "Widows," a group of older women who like to make sure everything is run "properly," and that includes getting all the single folks married off! If you're looking for an enjoyable book for summer reading, I highly recommend it. I just purchased the second book in the series, The Matchmakers of Butternut Creek. 1. It's the cheapest way to get into ham radio - I don't think there's a radio of this quality anywhere at this price. 2. It's not really hard to program manually, if you learn the tricks. It took me awhile but I finally put all 12 stations in manually. There is software for it, which is really easy to use, but I wanted to learn to program it so that when I'm on the road, I can program it on the fly. 3. It has a lot of extra features like a light, a siren, and an FM radio. Not sure that I'll use any of them, but it's cool anyway. If you've always want to get into ham radio, here's the radio to get (after you past your test, of course!). 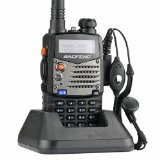 The Baofeng UV-5R is great for a gift, door prize for ham clubs, new operators, and for an extra radio! This will be a two-semester class for kids in 3rd-6th grade. 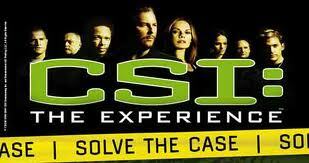 Semester I will introduce kids to the world of forensic science and law enforcement. Using fun, hands-on activities students will learn how police investigate crimes, collect evidence, and catch those crooks! Students will "solve" crimes by comparing fingerprints to catch a thief, unscrambling a coded message to stop a spy, analyzing handwriting to check for forgery, investigating soil samples to help a farmer, and identifying leaves to find a truck involved in a car accident. And that’s just the beginning. Each week, there will be a new crime to solve! 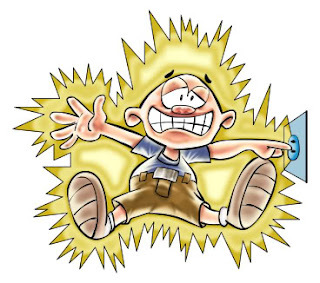 I'm already getting my ham radio friends pumped about holding a NET in class! This is going to be a fun, but extremely busy year ! Short Night = A new author discovered! Last night I couldn't sleep. I guess I had too much caffeine during the day. So I grabbed a new book off my "Books to Read" pile. The selection of choice was Queen of the Waves by Janice Thompson. I love anything related to the Titanic, so when I saw Queen of the Waves in the bookstore, I HAD to buy the book. My goal last night was to start the book and finish it over the next week. Instead, I kept reading until midnight; then I woke up at 3:30 am and finished the book. I loved it! The plot was a tad bit like A Connecticut Yankee in King Arthur’s Court. The main characters are two young ladies, Jacquie, born of high rank, and Tess, an abused young lady who is forced to tend pigs for her alcoholic father. They don’t switch places, but Jacquie convinces Tess to take her place on the Titanic so that Jacquie can marry the man she loves rather than the man her father has picked out for her. Tess agrees to go to get away from her abusive father. From there the adventures and life lessons begin. The story is fun, enjoyable, intense in some parts (great plot! ), and has a satisfying conclusion. It also has a gentle Christian message of a loving God and forgiveness. I'll definitely be looking for more books by Janice Thompson, especially if they are historical in nature. If you like historical fiction with a bit of romance and adventure, I think you'll like Queen of the Waves. This has been a great year so far at Cornerstone Tutorial Center. I have so much enjoyed my students that range from 13-17 years of age. 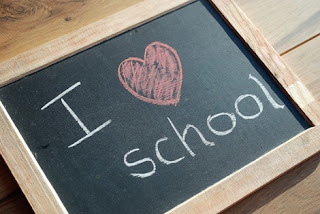 At the beginning of the year, I wasn't sure how I would like teaching teenagers as I haven't taught teens ever, except my own. I always taught the little guys and gals. Well, I have to say it's been most enjoyable, and I have definitely NOT been bored! These teens keep me on my toes trying to come up with ways to keep them interested. It's hard to compete with technology. In Biology, I put together PowerPoint presentations on every chapter. As we work through the chapter, I have them fill in a worksheet, watch videos, view photos and diagrams, conduct labs, and answer questions about the lesson; trying to use all their senses. I even throw in something totally irrelevant and sometimes outrageous just to "shock" them back to life now and then! Once I started doing using all the senses, their grades started improving. In Composition class, I thought I would be lucky to have the kids write a 5 paragraph paper. Instead, most of them went far beyond. Some of them are even writing mini-novels and I am encouraging them to enter writing contests. I'm so happy to see these guys and gals enjoying writing even if it means staying up late to grade their papers! I wasn't going to teach Marketing again because I didn't think we were having much fun. But things got better after we decided to do a class project on marketing our school. The kids interviewed staff, conducted surveys, and started creating videos, business cards, and flyers to advertise the school's services. They really got into the project. So, I guess I'll try it again next year with a few more tweaks and using a local nonprofit for our subject organization. All in all, it's been a great year. We only have a few weeks left, but I can honestly say, I'm going to miss it over the summer. However, it won't be long before I have a brand new set of kids! Next year, I'm teaching Biology, three Composition classes, Marketing and Oklahoma History. I'll have students in grades 3-6, 7-8, and 9-12. I'll be pretty busy over the summer preparing! There's an old saying that goes: "Nothing worth having is free." This saying is definitely appropriate for the recipes in Comfort Food Makeovers by America's Test Kitchen. If you're looking for low-fat recipes that actually taste good, this is the cookbook to get. However, it will cost you something: time and money. These recipes are not your usual, low-fat version. Instead, they use a combination of specific ingredients and special techniques to produce delicious versions of higher fat dishes found in most restaurants. For instance, you'll have to purchase specific ingredients; no substitutions allowed or the fat/calorie count will not be what you see in the book. This means either shopping ahead for ingredients such as Boar's Head 25% Percent Lower Fat American Cheese, Panko, Funyun Onions, and Italian Fontina cheese. Some recipes call for wine and sherry, as well. You'll also need a few special tools such as a water mister, oil mister, and mesh strainer; and you'll have to follow the directions precisely. That means you may need to pre-freeze meat or cheese, steam vegetables before using in a recipe, under bake cookies, use a foil sling (directions provided) or strain sauces. This all sounds like a lot of hard work, but as I said in the beginning, "Nothing worth having is free." If you take the time to shop ahead and prepare these dishes, you WILL be delighted with the results. The food is so much tastier than traditional low-fat recipes that you won't even know you're on a diet! Even though it takes more effort, I still gave it five stars because the food is so delicious! For those of us working full-time, it is a little difficult to cook like this on a regular basis, but it's perfect for weekends and special occasions or for people with more time to cook. There’s only one thing that Sarah Marshall wants – to get back to Chicago. Instead, she’s trapped in Kansas, tending her sick aunt, destitute, and trying desperately to find a way home. In the meantime, Karen Harper, the mother of three grown men in need of a wife, is desperate to keep Sarah at Harper’s Stage Stop. Surely, one of her three handsome sons will do just fine! This begins Vickie McDonough’s newest book, Whispers on the Prairie, a gentle message about love, forgiveness, and trust, all wrapped in a delightful romance that entertains and inspires. The problem is: which son? The oldest, Aaron, already lost one wife and is now the single father of two precocious children; the middle son, Josh, can’t wait to have his chance with the pretty lady; or Ethan, the youngest, who could care less. He just wants her to leave. At least that’s what he keeps telling himself. In the meantime, the word has spread in Kansas that a pretty young thing needs a wife and there are more than enough takers. Tensions mount and the adventures begin. What I love about Vickie McDonough’s books is that her stories not only entertain, but they also leave you with a gentle message of faith. For a girl who married a computer geek, instead of a rancher as planned, Vickie McDonough can still spin some of the best western romance this side of the Mississippi. I’m can't wait to read the next book in Vickie’s Pioneer Promises series! Biology (Tues & Thur. 8:30-9:55 am); Gr. 9-12. Exploring Creation with Biology is a Christian-based, rigorous, college preparatory course in Biology that will cover most of the textbook at a rate of one module every two weeks. Topics covered include cellular function, DNA, classification, genetics, evolutionary theory, ecology, and organisms from Kingdom Monera, Protista, Fungi, Animalia, and Plantae. Because the course is difficult and not all children learn the same, the material is presented in a variety of learning styles including PowerPoint presentations, videos, lectures, hands-on activities, labs and worksheets. This will ensure the success of every student who does the required homework. Kids Can Write / Oklahoma History (Thur. 12:05-1:25pm) Gr. 3-6: Semester 1 is a "First Writing Class" for students who have learned to write in both manuscript and cursive. The goal of the class is to take the fear out of writing. Students will create their own autobiography using photos and short texts, make pop-up books in a variety of subjects, and participate in a variety of hands-on activities that encourage writing. In Semester 2, students will use the writing skills they learned to create an Oklahoma History Notebook. Students will be introduced to the history, geography, economics, people, places, plants, animals, and important events of Oklahoma using all learning styles. During class, they will hear stories about Oklahoma, watch videos, listen to songs, cook recipes, create a timeline of events, complete worksheets, and participate in hands-on activities that will make learning FUN! At the end of the semester, the students will take home a notebook of worksheets and photos of projects completed that illustrates what they learned about Oklahoma History. Beginning Composition (Thur. 9:55-11:15am); Gr. 7-9: Beginning Composition is an introductory writing class for students who are just learning to write reports and essays OR who would like extra practice. Students will learn sentence and paragraph structure, outlining, and how to write the five-paragraph essay. Projects will include personal narratives, descriptive essays, expository essays, persuasive essays, and report writing for academic subjects. To encourage the students that writing can be fun, class activities may include an occasional "Wacky Research Report." During class, students will participate in hands-on activities to increase their vocabulary and grammar skills, brainstorm ideas, and practice specific writing techniques. Although the emphasis of this class is writing, the students will also work through 180 Daily Teaching Lessons, Gr. 8 (both in class and at home) as a review of grammar. This course will prepare students for Intermediate Composition. Intermediate Composition (Tues. 9:55-11:15am); Gr. 9-12: Intermediate Composition is a continuation of Beginning Composition and prepares students for Advanced Composition. Projects will include reports and essays in the form of personal narratives, descriptive essays, expository essays, persuasive essays, and report writing for academic subjects. These projects will be longer and more advanced than those in Beginning Composition. During class, students will participate in hands-on activities to increase their vocabulary and grammar skills, brainstorm ideas, and practice specific writing techniques. Although the emphasis of this class is writing, the students will also work through 180 Daily Teaching Lessons, Gr. 12 (both in class and at home) as a review of grammar. Marketing (Thurs. 1:30-2:50pm); Gr. 9-12: This course will introduce students to the world of entrepreneurship and marketing through two projects. In Part I, students will explore their own entrepreneurial potential. They will take a job interest and skills assessment, explore careers and entrepreneurial opportunities, brainstorm ideas for businesses, and learn how to manage time. Students will then work individually or in teams to create a product or service. Each team will write a business plan, a marketing plan and a financial plan for their business; create both print and online tools necessary to market their product or service; and present its business idea to a "Shark Tank" panel. In Part 2, our class will "adopt" a local nonprofit business and the students will work in teams to create a marketing plan for this organization. Teams will interview staff, conduct surveys to identify the market and create a variety of promotional materials including business cards, flyers, calendars, brochures, videos, and online media. At the end of the year, each team will present its marketing plan to the representatives of the nonprofit. Participation is through discussion, lectures, in-class activities, homework assignments, conducting surveys and interviews, Internet research and group projects.